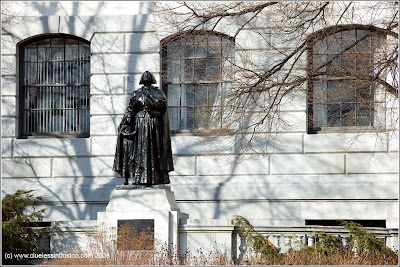 Statue of Anne Hutchinson on the front lawn of the Massachusetts State House. She was exiled from the Massachusetts Bay Colony for her religious beliefs and because she offended the mores of Puritan society. Her particular "heresy" was to maintain that it was a blessing and not a curse to be a woman, making her perhaps the first American feminist. I saw your comments on George Townboy's site that I loved and wanted to steal;) I popped over here to look around. I love your shot today. I like the starkness of the statue against the building and especially the reflections of the trees. I really like the blocks of glass in the previous post. I love the shadows in the background! Well, the Puritans didn't finish her off. But the Indians did. Poor brave woman.